Karina's Kreations: MDS Halloween Treat!!! Do you have My Digital Studio yet? if not you should think about it. 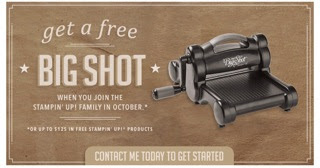 Stampin'Up has the Demonstrator starter kit special this month. Buy the starter kit and get a Big Shot FREE or $125.00 in FREE product. You could choose the My Digital Studio Software as an option. You would be getting it FREE!!!!! I don't use the program as much as I should but look at what I created today. I wanted to make Halloween treats for my stamping friends and don't have a lot of Halloween stamps. 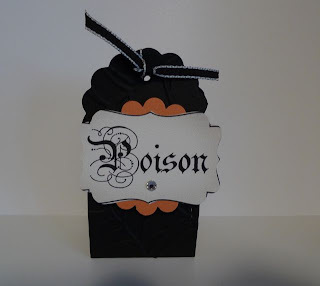 I went and bought the Pick You Poison Embellishments download for $6.50 or $5.23 ( with the demonstrator discount) and downloaded it in about 1 minute. I choose Multiple Output Option, 8-1/2" x 11" option, clicked on embellishments and there were my images. I choose 8 of the poison images and adjusted them on the page. I put a sheet of Whisper White card stock in my printer and printed them out. WoW!!!! It was so fast!!! 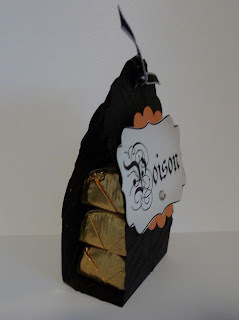 I punched out the poison image with the Decorative label punch and added it to my project. Do you love it????? I do and I hope my friends will love these treats too. 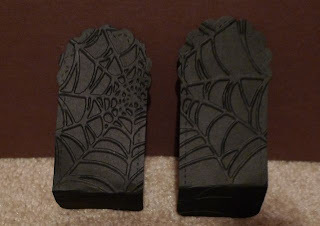 I also used the Bigz Two Tags die, Spider Web Textured Impressions Embossing Folder, Pick Your Poison DP, 1/8" Black Taffeta Ribbon and the 1-3/4" Scallop Circle Punch. I hope I have inspired you to dust off your MDS program.